Here we come to the conclusion of my review for the Starship Troopers movie series. To recap, I gave the original film an A- because of its perfect blend of satire and over the top sci-fi action. It’s one of Verhoeven’s best and stands as a classic of the 1990s. It’s sequel was lucky enough to slide by with a D since it completely lacked all of the great stuff from the original and felt like such a huge departure from what this series should be. Now we have Starship Troopers 3: Marauder and Starship Troopers: Invasion to pick up the slack. They have a lot riding on them after the abysmal second film, so let’s see how much the can do for the series. 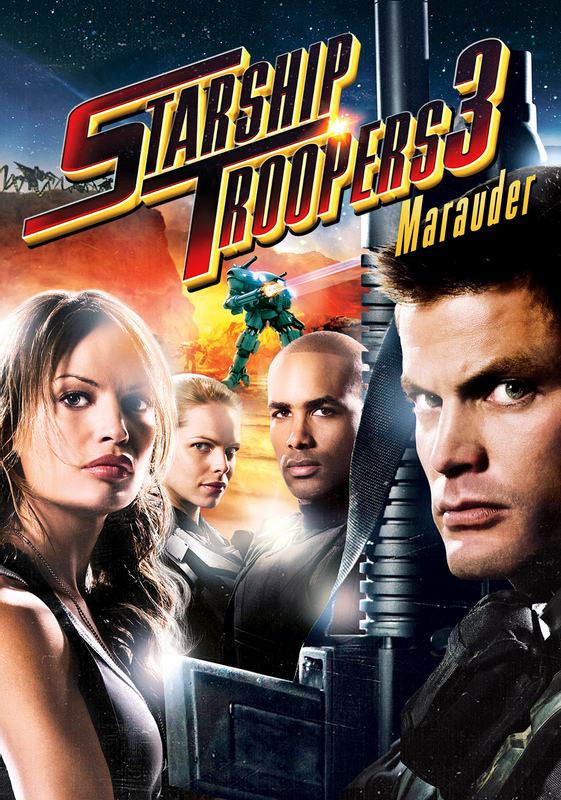 In 2008, Starship Troopers 3: Marauders was released on DVD, making this the first film in the series to go right to DVD after the first film was a major theatrical release and the second was a TV movie. Luckily, this film, despite its direct to DVD status, picks up some of the slack. The war with the Bugs has been going on for over a decade, and the Federation is still unable to outgun the overwhelming numbers of their enemy. On the planet of Roku San, Col. Johnny Rico (Casper Van Dien) is in charge of a large military base that is being inspected by his old friend Gen. Dix (Boris Kodjoe) and Sky Marshal Anoke (Stephen Hogan). When the Bugs get through the perimeter of the base, the Sky Marshal is forced to leave on his ship which is soon shot out of the sky leaving him and a small crew stuck on a desert planet. Under the leadership of Capt. Lola Beck (Jolene Balock), this crew starts moving towards a section of their broken ship to call for evacuation while avoiding the Bug swarm. Meanwhile, Dix recruits Rico to lead the new Marauder program, which would put him at the head of a unit of soldiers donning mech-like power armor to go to the planet’s surface and rescue the survivors before it’s too late. After Hero of the Federation deviated from the structure and style of the first Starship Troopers film, it was a nice surprise to see Marauder return things to what they once were, for the most part. This is another direct to DVD release, so there’s a major limit on what can be done, but this movie and the film makers behind it clearly have some major ambition. The writer of the first and second films, Edward Neumeier, returns again to write the screenplay but also takes a spot in the director’s chair. That being said, he did a pretty good job all around. It was great to see the character of Johnny Rico come back, especially with Casper Van Dien reprising the role. This helped this film really feel like it fit in nicely with the original. More attention is also given to the idea of psychic soldiers, and the satirical humor makes a lot more of a comeback than it did in the previous film. The Federation as a whole is front and center at this one, which also gave me a clearer and wider look at the world these movies occupy. While this movie does fix a lot of problems from the second one, like being more interesting, better looking, and having better special effects, there’s still glaring problems to be seen here. First off, Johnny Rico is established in the beginning, and it was great to see him again. After a while though, he takes a back seat to the people stranded on the planet. I figured that would all be fine because when he takes command of the Marauders, it’s gonna be awesome. Well it kinda sorta was. The ending of this movie is very anti-climactic and I was pretty disappointed. When the mech suits land on the planet, I was so ready for a big throw down with the Bugs, but it was over before it even began and nothing that cool even really happened. It was a wasted opportunity that should have been part of the movie more. Finally, there’s this weird theme about religion that is beat over the viewer’s head, but in the end, the film can’t seem to figure out its stance on the subject which just makes it really annoying. These are some major problems in an otherwise good film. Starship Troopers 3: Marauder is a really impressive direct to DVD movie and it a pretty worthy successor to the original for what it is. It still suffers from the low budget that most, if not all, direct to DVD movies suffer from, but the ambition overshadows that. There’s a lot of great ideas in this movie, but there’s unfortunately a lot of problems holding it back from reaching its full potential. If you’re a fan of the original Starship Troopers, this movie continues the story and the mood much better than the second film and works well as fleeting entertainment. It’s not great, but it’s alright. With three live action feature films, it would’ve made sense to leave this series as a trilogy, but in 2012 we got another entry. This film was released in theaters in Japan and direct to DVD in the United States. 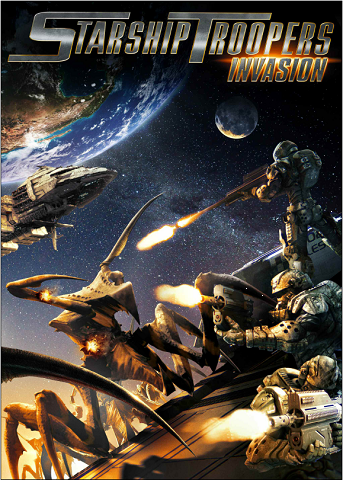 Surprisingly enough, Starship Troopers: Invasion was a pretty cool addition to the series. As the war rages on, the Bugs have begun attacking more Federation outposts like the asteroid base, Fort Casey. While the Bugs are in the middle of their siege, and elite team of the mobile infantry lands to rescue the crew and destroy the base so no Bugs can escape. Along with the infantry, pilot Capt. Ibanez (Luci Christian) and Minister of Paranormal Warfare Carl Jenkins (Justin Doran) escape the base, but Jenkins commandeers Ibanez’s starship before mysteriously going dark. Before Ibanez and the soldiers can get home, Gen. Johnny Rico (David Matranga) orders them back to find the starship that went dark and investigate what went wrong. After finding the ship, the infantry and Ibanez find the crew wiped out and Jenkins hidden away in the cargo hold. Soon, the Bugs make themselves known and the fight for survival begins as a Queen takes command of the ship and directs it onto a crash course for Earth. The first thing you may notice about this movie is that it is completely computer animated. This could have either helped or hindered the movie, but in this case I think it helped. The animation isn’t anything special but it works well enough for the story, and the actors were all motion captured which gives the characters a little bit more life in their animation than they otherwise would have. This being a computer animated movie, there’s also a lot that could be done that otherwise couldn’t have been without an insanely huge budget. For one thing, the power suits finally get to do a lot, and we finally get to see how powerful and useful they really are. We got a glimpse of them in Marauder, but with Invasion you finally get to to really see them in action. Speaking of action, this movie has plenty of it, and that’s both a good and bad thing. There’s plenty of scenes where the Bugs chase the troopers down endless corridors and trap them in seemingly impossible situations that they have to fight their way out of, but it does get a little repetitive after a while. There’s no grand battle scene or anything like that to shake things up. There’s also a lot of characters in this movie that don’t have a chance to get fully developed, so when some of them do die, it feels like a wasted potential for some real drama. This is something that the original Starship Troopers did well, but none of the others could quite match. Still, when the action picks up, especially towards the end, it does get to be a lot of fun and is the kind of stuff that this series is based on. Starship Troopers: Invasion is oddly enough the best film in this series since the original, but it still doesn’t quite live up to that one in many ways. There are some cool characters, the animation looks good, and there’s plenty of action to keep die hard fans of the series entertained. It was also cool to see more of the original characters make a return. Unfortunately, the lack of character development and the repetitive nature of the action stop this movie from becoming something of a cult classic. Fans of the series will probably enjoy this one while people unfamiliar with the world may not see anything too special. Well, there you have it. All in all, this is a pretty lackluster series. The first film was an outstanding, satirical sci-fi/war film while the second one has a special spot at the very bottom of the bargain bin for all eternity. Some redemption was found with the third and fourth, but not enough to really hearken back to the original film. These movies can be an interesting watch, but it may be best to just stick with the 1997 original by Paul Verhoeven.